Most youth coaches either have no effect on their teams or actually cause them to play worse, especially in the batter’s box and on the base paths. The almost universal practice format of 45 minutes of infield and 45 minutes of batting practice is a waste of time. Youth Baseball Coaching was written by an experienced youth coach who tried all the stuff you’re supposed to do, found most of it did not work, then experimented with different coaching methods. This books tell you about the ones that worked. Not only youth baseball coaching approaches that work, but that work fast because a youth season is too short for methods that work slowly. The book is also real world covering subjects like cheating in the draft, the parents meeting, and how to deal with the weakest players. 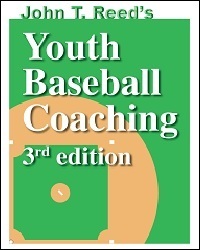 See my other articles on youth baseball coaching. “Last season...the team hit .267. This year, after reading your book, we...hit .406 as a team. .606 on base percentage too!” Robert J. Merlino, Jr.
To see the full text of the above testimonials and many others, click here.